The Wabash soccer team's tough-luck season continued Saturday with another one-goal loss, this time on a penalty kick against Kenyon to fall 2-1 to the Lords at home in North Coast Athletic Conference action. Kenyon, ranked third in the Great Lakes Region in the latest National Soccer Coaches Association of America poll, scored early on a goal by Tom Nolan to take a 1-0 lead. The Lords held that lead through the first half before Austin Jennings recorded his second goal of the season in the 67th minute to even the score at 1-1. Minutes later junior Femi Oluyedun received his second yellow card of the match, forcing him to leave the field with an accumulated red card while leaving the Little Giants with 10 players for the final 18 minutes. The Lords took the advantage, eventually scoring the game-winning goal on a penalty kick by Felix Hoffman in the 77th minute to improve to 11-1-1 on the season with a 3-1-0 mark in NCAC play. "We played well in the first half against a very good regionally-ranked soccer team in Kenyon," Head Coach Roberto Giannini said. "Despite an early first-half goal and only one shot, the game was pretty even. We really took to Kenyon in the second half. We had more shots on goal and more opportunities. Austin scored a goal to equalize the match, then five minutes later Femi Oluyedun hits the cross bar on a very good shot off a beautiful build by the team. "Femi picked up his second yellow card on a really tough call a few minutes later, which left us down a man. Four minutes later Kenyon won it with the penalty kick. Once again we didn't deserve to lose based upon the way we played. The effort was equal to Kenyon's --- a very good team that is well coached with a couple of All-American play. We really deserve a break. Sometimes you have to have some luck during the season, and we've had none this year. This is the fifth straight game we've played excellent soccer, but have come away with a one-goal loss. Our record is no where close to an indication of how well this team has played this year." The loss dropped Wabash to 6-9 for the year and 0-5 in the NCAC. The Little Giants have lost four of their past five matches by one goal, including two overtime defeats along with a 2-0 loss at nationally-ranked Ohio Wesleyan. The Little Giants will have a week to prepare for their next match, a 2 p.m. home contest against Oberlin College next Saturday. Photo - Austin Jennings works for an opening against the Kenyon defender. 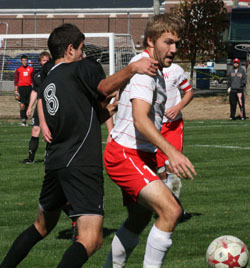 Jennings tied Saturday's match at 1-1 before Wabash eventually lost 2-1 to the regionally-ranked Lords. Photo by Susan Albrecht.